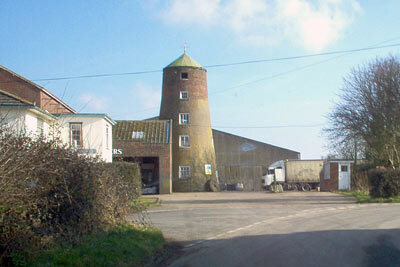 Stratton St Michael towermill was built on a site to the east of the A140 Norwich to Ipswich road. Originally built as a three storey red brick mill, two additional stories had been added by 1865, with the batter being reduced. A steam engine was installed c.1914 to provide auxiliary power. A postmill to the north of the mill house was under the same ownership during at least the 1820s and 1830s. The mill used 4 double shuttered sails struck by rack and pinion to power 2 pairs of stones and 2 flour mills. Each sail had 8 bays of 3 and 1 bay of 2 shutters. The Norfolk boat shaped cap had a petticoat and held a 6 bladed fan and a chain pole. Rex Wailes reported that on the upright shaft, a footstep in a brass pot was let into a spindle beam. To be Sold. Two capital Corn Mills, one a Brick Tower Mill, and the other a Post Mill, with Round House, Granaries and other convenient Buildings, in excellent repair, and about two acres of land, late in the occupation of Mr. James Aldred, situate at Long Stratton, Norfolk. Immediate possession. 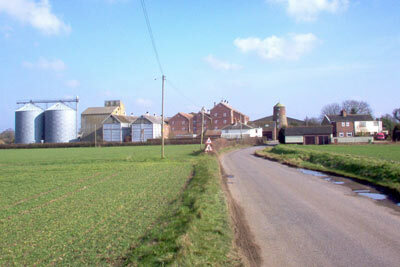 Two Capital CORN MILLS, one a Brick Tower Mill, and the other a Post Mill, with Round House, Granaries and other convenient Outbuildings, in excellent repair and about two acres of Land, late in the occupation of Mr. James Aldred; also two Cottages with Gardens in the several occupations of Samuel Lent and others. The above Premises are situate at Long Stratton within ten miles of Norwich. Immediate Possession may be had. Notice is hereby given that James Aldred the Younger, of Stratton St. Michael, in the county of Norfolk, Miller and Farmer, hath conveyed and assigned all his estate for the benefit of his creditors. Deed of Assignment for the benefit of all creditors. To be Sold by Auction by Mr. SHARPE at the Swan Inn, Long Stratton on Tuesday 22nd April 1834 at 5 o'clock. Messuage, Malting Office, Outbuildings, double Cottage and about 120 acres of excellent Land at Stratton St. Mary, Stratton St. Michael and Morningthorpe, late in the occupation of the said James Aldred or his Tenants. Lot 3. A Piece of Freehold Arable Land at Alburgh, 3a. 2r. 18p. now in the occupation of Mr. James Aldred the Elder. To be Sold by Auction by Mr. J. B. SHARPE at the Swan Inn, Long Stratton on Tuesday 29th (instead of the 22nd) day of April 1834 at 5 o'clock. Lot 1. All that brick TOWER WINDMILL, three stories high, with patent sails and a Stable and Granaries. Also a capital Post_Windmill with Granary. Also two good Cottages and a Tenement now used as a Dissenting Chapel. 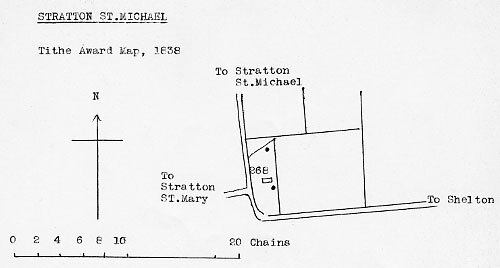 Together with a piece of Land containing about two acres situate at Stratton St. Michael and late in the occupation of the said James Aldred. Lot 4. Piece of Freehold Arable Land at Alburgh, 3a. 2r. 18p. now in the occupation of Mr. James Aldred the Elder. To be Sold by Auction at the Swan Inn, Long Stratton on 29 April, 1834, by order of the Trustee for Sale thereof, late the property of Mr. James Aldred the Younger. All that brick Tower Windmill, three stories high, with patent sails, and a stable and granaries. Also a capital Post_Windmill with granary. Also two good cottages and a tenement, now used as a Dissenting Chapel, together with a piece of land containing about two acres situate in Stratton St. Michael and late in the occupation of the said James Aldred. of Farming Stock, Household Furniture etc. "on the Premises at Long Stratton, Norfolk"
To be Sold. 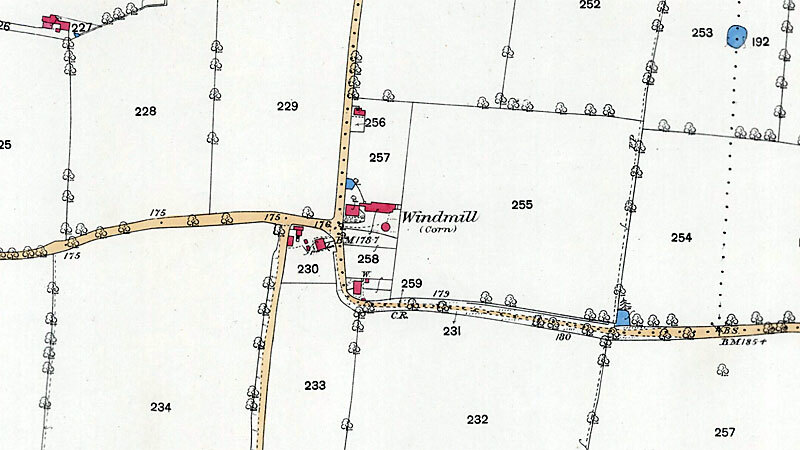 A new built Brick Tower Windmill and a good Post_Windmill, also two Cottages, a Dissenting Chapel, and about two acres of land, situate in Stratton St. Michael, late in the occupation of Mr. Aldred. Immediate possession may be had. A new built Brick TOWER WINDMILL, three stories high, with Patent Sails and Stable and Granaries, also a capital POST_WINDMILL with Granary, also two good cottages, a Dissenting Chapel and 2 acres of Land situate at Stratton St. Michael, late in the occupation of Mr. Aldred. A new built Brick Tower WINDMILL, three stories high, with Patent Sails, Stable and Granaries. Also a capital Post_Windmill with Granary. Also two good Cottages and a Tenement now used as a Dissenting Chapel, together with a Piece of Land about 2 acres situate in Stratton St. Michael, late in the occupation of Mr. Aldred. The map above shows to postmill to the north of the mill house and the towermill just to the south. James Goodswen miller, of Stratton St. Michael, appoints Mary his wife, and his two sons in law, William Field of Pulham St. Mary Magdalen and Benjamin Coppings of Hardwick in the said County, Millers as executors. Everything to his wife Mary, for her lifetime apart from the 3 WINDMILLS, situated in Pulham St. Mary Magdalen, Hardwick, and the one is own occupation in Stratton St. Michael. Wife to receive an annuity from the mills profits etc, and something provided for the daughter Julia Goodswen. 2. I give devise and bequeath all my messuages, cottages, lands, tenements and hereditaments with the windmill thereupon built and the tackle and going gears thereof complete, situate and lying in the parish of Pulham St. Mary Magdalen aforesaid copyhold of the Manor of Pulham, as the same now in the occupation of my daughter Mary Ann, the wife of William Field. To hold the same etc for Mary Ann and her heirs and assigns. The windmill in Stratton St. Michael, now in my own occupation I give and bequeath to my daughter Elizabeth Goodswen. All persons having any claim upon Mr. William Robertson, larte of Stratton St. Michael, deceased, are requested to send the particulars therof either to us or to Mrs. Mary Robertson, the Widow, in order that they may be examined and discharged. All persons indebted to the deceased are requested to pay the amount of their respective debts forthwith to Mrs. Robertson, by whom the business will in future be carried on. William Robertson was the eldest son of William Robertson and Mary Scarffe of Hethersett. 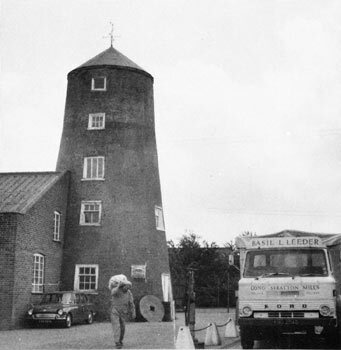 William jnr's brother George took over the running of Hethersett Gt Melton Road postmill in 1829. Robert Robertson took over at Market Hill mill in Yarmouth before moving to Sporowston. Abraham Robertson took over the lease of Deopham smockmill on 18th September 1826. Elizabeth Robertson married John Hastings who was running Starston postmill in 1854. Susan Robertson married George Willis, a miller & baker from Mendelsham, Suffolk. John, Simon, David and Samuel Robertson do not appear to have become millers. John's son George Wilby Robertson worked one of the mills in Upper Hellesdon and one of the mills at Gayton. Robert's oldest daughter, Elizabeth, married a Harrison. Her sons worked at Oulton Broad, Gisleham, Wangford, Sprowston mills. Oldest son Robert William helped at one of the Sprowston windmills after his father's being crushed to death and later bought Oulton Broad. Next son, George, continued the family line at Sprowston. Youngest son, William Alfred, was an apprentice at Wymondham, journeyman at Great Bentley, Essex and owned the St Margaret's Church Mill in Lowestoft. Abraham's son Wiliam Proctor Robertson worked a mill in Eaton. and piece of Pasture Land containing together 1a. 3r. 14p. Also a capital brick tower WINDMILL with five floors, driving two pairs of Stones and two Flour Mills, Stable, Warehouse, Cart Lodge, Gig, Chaff and Fowl-houses. Also a POST WINDMILL with spacious Roundhouse, driving 3 pairs of Stones. The above are in the occupation of the Executors of the late Mr. Wm. Robertson, deceased and possession may be had at Michaelmas next. Apply to Messrs. Mitchell & Clarke, Solrs. Wymondham, at the Place of Sale or of the Auctioneers, Norwich. 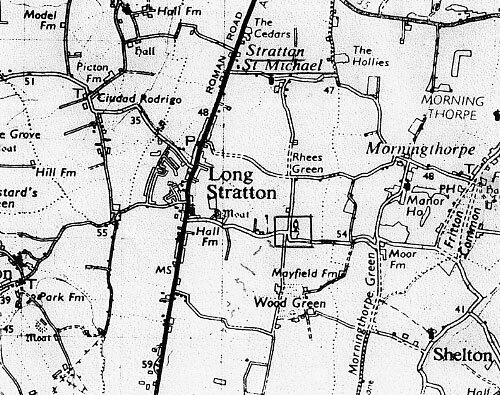 Two Capital WINDMILLS, Dwelling House, Stables, three Cottages and 4 acres of Land situate at Long Stratton in the occupation of Mrs. Robertson. Apply to Mr. Fryer, Bracon Ash or Mr. Hall, Ipswich Road, Norwich. To Let with immediate Possession, two capital WINDMILLS with an excellent Dwelling house, Stable, three Cottages and 2 Acres of Land situate at Long Stratton, in the occupation of Mrs. Robertson. Apply to Mr. Fryer, Bracon Ash or to Mr. Hall, Ipswich Road, Norwich. The Tower mill has Five Floors , Patent Sails, two Pairs of Stones with two Flour Mills, 5-stall Stable, Warehouse etc. etc. The Post Mill has a spacious Round House - three pairs of Stones. Particulars of Mr. Fred Fox, Surrey Street, Norwich. TO BE LET with possession at Michaelmas next, a TOWER WINDMILL with Flour house and Buildings belonging thereto, Dwelling House and Garden, Cottage and other Buildings and 20 acres of LAND. Also a FARM comprising Farm house and Buildings, all in good repair, excellent Orchards and 177 acres of Land in a good state of cultivation and lying conveniently for the Premises. Apply to Mr. Andrews, Morningthorpe, Long Stratton. By 1972 a leanto building had been built against the tower and the mill had been capped with a conical green roof bearing a weathervane. At this time the mill was still trading as Long Stratton Mills. That’s why the miller took off the sails. If it isn’t gone, it stands there still. Leeder said "thank God now I can earn". There was a fire at Long Stratton mills in the 1950s my dad was a builder (R. S. Norman) and he rebuilt the mill for Mr Leeder, to do this he had to take on more men. I think there is a Notice on the back of the building saying that the building was rebuilt after a fire in the fifties.